Hi there! We are Mario and Candy Famada, happy parents of five beautiful children and proud owners of one of the Best Miami Roofing Companies… City Roofing, Inc. If you’re on this page, you are probably looking for a reliable and trusted Miami roofing company for your next project. And most importantly, you need your project to be finished on time and when promised! If all of the above sounds familiar, then you’re in the right place! Whatever your project, we are here to help you make your dream a reality with the utmost professionalism. 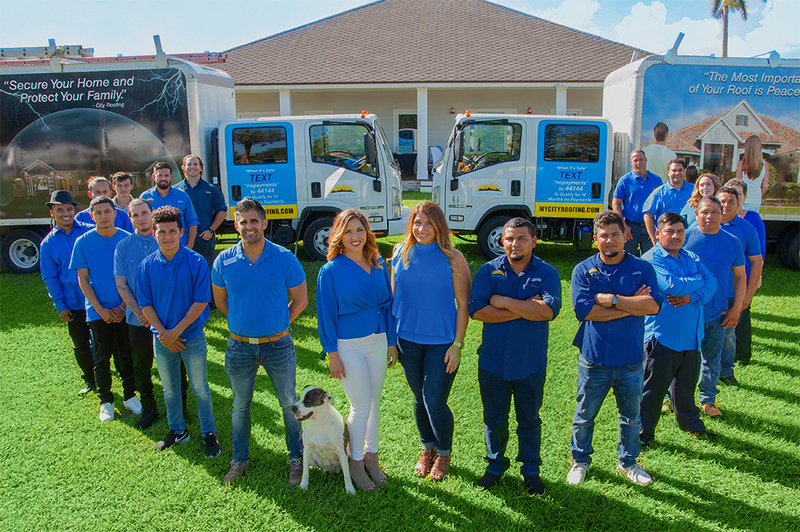 Together with our trusted team, which we consider part of our family, we have been serving our South Florida Roofing community for over 11 years now, always delivering top quality services, at affordable prices. City Roofing was created because in 2006 after Hurricane Katrina we couldn’t stand seeing how South Florida Homeowners were being treated by roofing companies, so we took steps to champion the cause for the homeowner and recreate the industry’s integrity. In giving an ear to those who were not being heard by other companies, City Roofing became the echo of what every homeowner was voicing they needed in a Miami roofing company and the real-life reflection of what homeowners desired to see done when a Miami Roofing Company came out to work on their house. What Makes Us Stand Our As A Miami Roofing Company? The State: We make sure we meet and surpass requirements. Mother Nature: Our goal is to make sure our work stands the test of South Florida’s crazy and often dangerous weather. You (our customer): We want you to see our work and not just feel good but KNOW you have had the best work done and are safe from the South Florida weather. After all Peace of Mind is priceless. To give YOU Peace of Mind, we put our WHOLE company under review and inspection so we could get certified by The Seal ™ a national compliance and background verification company who has investigated us (Mario and Candy) AND our team. They made sure we have our licenses up to date, our Insurance is paid for, active and covers the amounts needed to work on your home. Plus, they made sure we meet all the State and local requirements to work in your city. BUT WAIT THERE’S MORE! They also made sure that our team had no one with a criminal background working on your property or around your family and children. Yes, when you hire us you have TRUE Peace of Mind. Click here to find out why. Transparent Communication: From day one, we set ourselves apart from other South Florida Roofing companies by sharing truthful timelines and worst case scenarios as well as the best-case expectations. We use the latest technologies to show you your choices, we communicate in person or for those with hectic schedules via phone and in private company video rooms. Truthful Recommendations: We look at the project and give accurate costs. However, if along the way, we find underlying damages that could not have been seen from the initial visit due to obstruction of view. (We can’t see through solid objects ) we will advise the homeowner what it consists of, what it means, the best way to handle the issue and the actual timeframe it needs to be handled in. This way the Homeowner can choose to add the work to the current project or wait until a later time. Either way, we make sure your work is done in a way that leaves your home safe. Safety & Privacy: Our Team working on your home has had current background checks to make sure you, your home, your spouse and family are safe AND for jobs longer than a day, we have an outside restroom on-site so Team Members do not have to walk through your home and bother you. Since they do not have to leave the site you benefit because we can complete your project faster. 360 Eagle Eye Post Inspection: Once the job is done we not only provide you with pictures of the finished work, but we also have our team go completely around your home looking both from ground level with an Industrial Grade Magnet and from your roof down to make sure nothing was accidently left behind, blown by the wind, or misplaced. Such as: shingles, nails, tiles, etc. Anything that could hurt a little one, a pet or a guest. Post Project Support: Once the project is completed and you have signed off on your satisfaction with our work. The real fun begins. We adopt you as part of our City Roofing Family. You can get yearly maintenance packages, roof washings mitigations and much more. You have priority support after a hurricane and same day tarping in many cases in case a storm has left you in need. We do not expect you to call us other than to refer someone (60% of our business is from referrals) or to say hi but if you need to call … we WILL be here. Guaranteed! We are NOT your average Miami Roofer– we don’t just SAY we love and ENJOY helping families make their dreams come true… WE PROVE IT. Driven by a sincere appreciation for the love we received so far from Miami homeowners, the South Florida Community as a whole and a deep desire to help families in need, we have created the “Raise The Roof Organization”. This is a non-profit organization that offers free roofing services to people who need it. From those in dire health issues to the elderly and even our veterans! For every roof we install, a percentage goes directly to support this cause and help families who are struggling due to illness, age or just tragedy happening to be safe, sound, and secure from the quickly changing and sometimes dangerous South Florida weather. As of 2017 We are the leaders in the Miami Roofing Industry and the numbers speak for themselves! Winner of Angie’s List Super Service Awards – for 4 years in a row! Best reviewed roofing company in Coral Gables–with over 500 five-star reviews from YOUR neighbors… and counting! Help your community at the same time. Give us a call! We’re here to serve YOU!